The goal of CLL is to promote and integrate the principles of lifelong learning into society, ensuring the continuation of previously acquired education and the development of education according to the demand of labour market and personal interests. The main activity is development, offering, implementation and management of lifelong education programmes. CLL invites university lecturers, masters and doctoral students to carry out scientifically practical training in Rezekne Academy of Technologies. 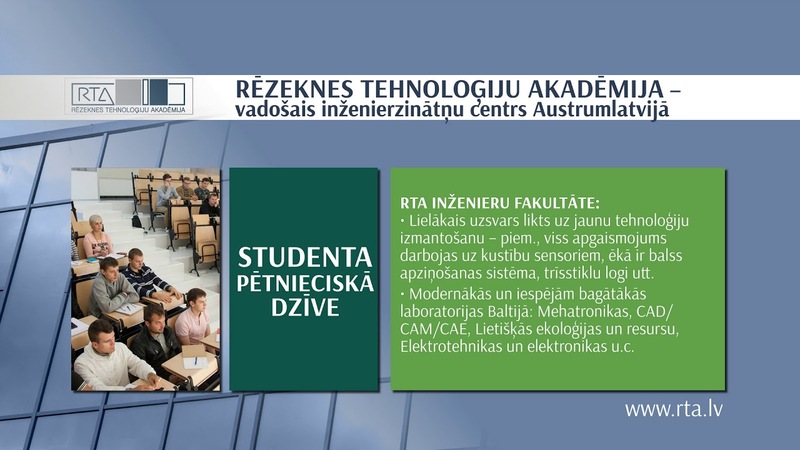 Aim: the training is offered to university lecturers and students who represent various scientific fields and who wish to improve their professional qualification, further develop previously acquired knowledge and skills, acquire additional experience and consult the professors of Rezekne Academy of Technologies. Available periods for training: during school year (September – June), upon agreement. Length of the training: 1 - 2 weeks (upon agreement). Languages of instructions: English, Russian. Place: Rezekne Academy of Technologies. Lessons and consultations by scientific manager (professor from the university), discussions of scientific questions, dissertation, and thesis development methodology included. 10 academic hours per week. Consultations for preparation of scientific publications. Opportunity to use scientific laboratories, library resources, data bases, computers, and Wi-Fi. Opportunity to attend classes together with RTA students in your field of expertise (English language). Centre for Lifelong Learning curator’s support is offered throughout the whole programme. Study tours, excursions in Latgale. Shuttle from/ to Riga airport. Accommodation in three-star Hotel Kolonna Rezekne (with breakfast). Written affirmation of training (CLL certificate). A list of training topics. A statement from the university you attend/teach in (to verify that you study or work there). 2 weeks - 850 EUR per person. 2 weeks - 1050 EUR per person. 2 weeks - 1650EUR per person. Organization of the training – 80 EUR per person. Catering services in Rezekne: 2.00-5.00 EUR per meal. Public transportation: 0.50 EUR per trip within the city. Latgale (Eastern Latvia) is the only region in Latvia that has its own language that is still widely used, as well as a dominating religion - Catholicism. The language and religion determine to a great extent the different mentality and strong traditions of Latgalians. Rezekne is located at an international crossroads, with routes to Riga (242 km), Moscow (685 km), St. Petersburg (450 km), and Warsaw (860 km). The River Rezekne flows through the city for a total of ten kilometres, and Lake Kovšu (covering 22 ha) lies at the centre of it. Rezekne is known as the city of seven hills. The city’s footprint covers 17.48 km2 (with green areas and water accounting for 16% of this). It has a population of 29,948 (2014).